Last week we announced the release of our new 2013 product line and today I’m going to delve into our new wedding collections! Typically the release of a new wedding collection means one more color and design option for brides. This year we’ve taken an entirely different route and the result is an opportunity to create a wedding accessory specific to your style and color theme! Oh yes, it’s as exciting as it sounds! The color personality collections come in five different designs; The Stephanie, The Amanda, The Crystal, The Nicole and The Jennifer. Each collection features a ring pillow and a petal purse. Now, I did promise you customization didn’t I? Well you see, it just so happens that you can choose from 27 stunning colors for each of these collections. But don’t go yet, that’s not all! I’m not saying that we’re giving you only 27 color options – no no. 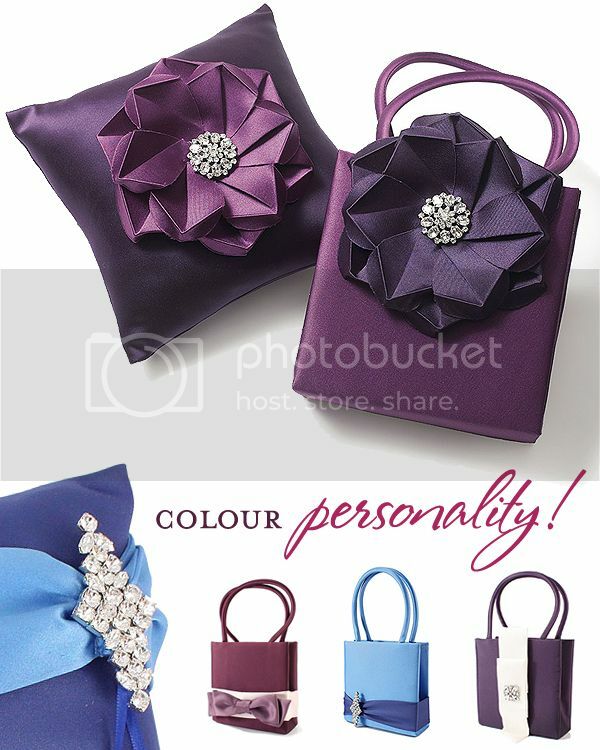 Once you’ve chosen your base color (so the color of the petal purse or ring pillow), you also get to pick the color of the accent (whether it’s the bow, flower, ribbon, etc…) and in the case of The Jennifer, you can choose your base color, the color of the top rosette and the color of the bottom rosette! With the five collections and the 27 color options there are a total of… let me do some quick math here… (27*27*4) + (27*27*27) = 22,599 possible design and color combinations! Whew. Don’t Panic. If you’re indecisive it won’t be as stressful as it sounds, just choose the design you like the best and pick the colors that blend with your wedding theme. Easy as pie. To check it out just go to the product page of one of the ring pillows or purses, (click here for The Jennifer Petal Purse) and look for the pink “Design Studio” button, which is right below the product picture on the left side. To view all five of the new collections, click here. We are also pleased to announce three new Beverly Clark wedding collections! This collection features an elegant black lace against an ivory matte satin base. If you’re looking for wedding accessories to suit a formal wedding reception, this might be exactly what you need! 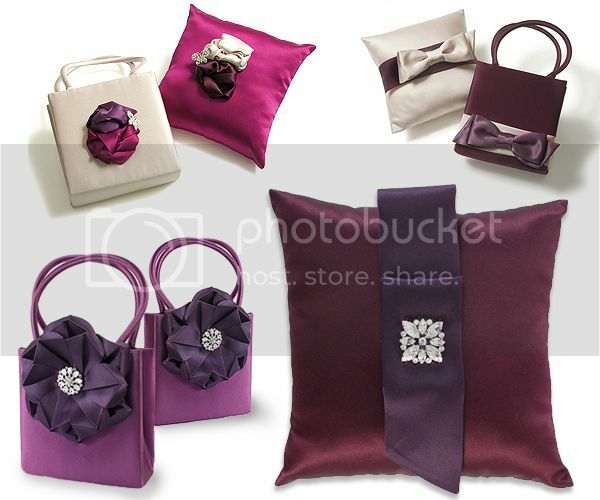 This dramatic collection includes a wedding ring pillow, a flower girl basket, pen holder, guestbook and garter set. Available in beautiful ivory satin, this collection is accented with perfectly shaped bows and rhinestone buckles for a little added glamour. Its classic look would suit many different wedding styles! The Duchess collection includes a wedding ring pillow, a flower girl basket, pen holder, guestbook and garter set. La Fleur is our final new ivory collection; the flower that is found on each piece is made from vintage lace, netting and petals with a faux pearl center. Once again this collection is complete with a wedding ring pillow, a flower girl basket, pen holder, guestbook and garter set. Be sure to let us know which collection is your favorite! What do you think of the idea of a petal purse?